Businesses over the past ten years have used email archiving solutions in order to meet record retention compliance, facilitate electronic discovery, and control message-related storage costs. Despite these benefits, many organizations still have not adopted an archiving solution and still simply enforce mailbox quotas or message deletion policies as the best way to manage messaging environments. 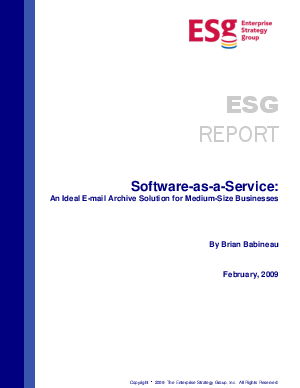 ESG Research studies have revealed that the inhibitors for adding archiving for many medium-sized companies are a lack of IT infrastructure needed to support implementation, a lack of skilled IT staff to run an email archive environment, or that staff augmentation is needed to handle proper email administration. In this analyst report, we'll discuss why these medium sized businesses need email archiving, how to make an informed email archive purchase, and making the case for SaaS-based archiving.